Scientists say fossil evidence indicates that over time, birds evolved from the dinosaurs. While unique and desirable, today's Nice Price or Crack Pipe Thunderbird does demonstrate that the evolutionary process also works in reverse, but will its price be a bone of contention? In the middle of the last decade Morris Garages packed up their Whitworths and moved to Nanjing, China, where their cars are still being built to this day. Despite their continued ex-pat existence, MGs are no longer sold in their mother land and they lament that, in China, Toad-in-the-hole involves real frogs. They are also not sold in the U.S., and officially neither was yesterday's Hogwarts Express 2004 MG ZT-T V8 wagon. That didn't stop 54% of you from voting Nice Price for ts sub-twenty grand cost of keeping it in the country, and a few of you from offering to marry it so it might gain a green card and stay. Today's candidate is also Ford-powered, and in fact is Ford-freakin'-everything. The Blue Oval boys struck pay dirt when they brought the first Thunderbird to market back in 1955. But in the expansive era at the dawn of the rocket age, a common mantra was bigger is better and Robert MacNamara - then Ford's president - felt that if the T-bird did grow, so would its sales. Turns out, he was right. After only three years as a two-seater, the '58 ‘Bird grew a set in the back and saw sales shoot up. A refresh every couple of years kept the big personal coupe competitive against encroaching competitors, and the car continued to provide a halo for the remainder of Ford's more mundane lineup. Then something happened, and that something was the Mustang. Suddenly Ford's personal coupe had a pony on its grille and not a mythological bird. Seeing that it was getting a little too crowded at that end of the bar, Ford took the T-bird in a new direction for '67, returning the car to girl-on-girl body-on-frame action and eliminating the open-top version. That ying without its yang would have led to an imbalance of global proportions so Ford replaced the fun-in-the-sun version with a baroque fordor featuring suicide rears and landau bars, FTW. 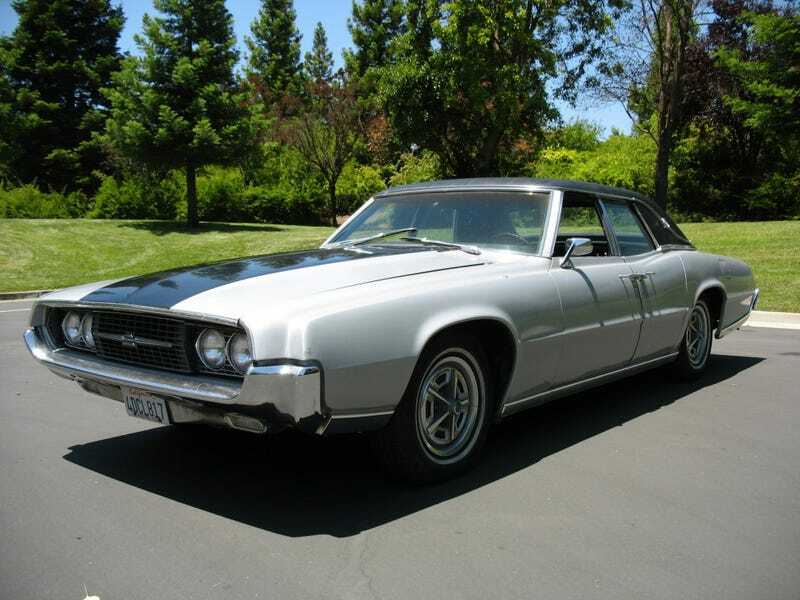 This 1967 Thunderbird is just such an example and is claimed by the seller to have been restored. Restored! actually, and what the exclamation point signifies other than a sense of excitement over the odd paint scheme goes unexplained. It's hard to gauge from the photos exactly what color this T-bird is wearing other than the wide black stripe that adorns it like an ill-fitting toupee. Is the remainder silver? A dingy white? Whatever it is, it doesn't appear that all the trim found its way back to the car post-paint. There are script badges missing from teh rear fenders, and the brushed steel trim on the Dodge Charger-esque tail light surround is shy one section. The vinyl roof is claimed to be new, and is so heavily padded the car could be used to save babies flung from burning buildings. A unique feature of the fifth generation Thunderbird is those suicide rear doors - a first for both presence and actuation for the T-bird, as the car had previously only been available with two forward-hinged units. The doors not only open bass-akwards, but the opening cuts into the landau roof - the s-bar defining the trailing edge - in such a way that when closed the car takes on the appearance of a massive coupe. This, along with the black interior lends this T-bird a sinister appearance befitting a ‘60s gangster. It also looks like the Battlestar Galactica. Ha! Now try and see it without thinking that. Motivating Adama's command is one of two V8 options - the seller is tight-lipped as to which - either a 315-bhp 390 or a 428 with 345 ponies. Since over 90% of the ‘67s came with the 390, we can assume that's what's under the hood of this one. The transmission is Ford's durable and ubiquitous C6 three-speed, and the underpinnings are typical sixties Ford which means a-arm front, leaf sprung live axle back and the ride quality of an ocean liner. It may seem like the Thunderbird's development path from svelte two seat grand tourer to four-door luxo-barge may seem like an evolutionary regression, but sales would prove Ford's decisions to be well planned. This edition seems to be a fine example of one of the marque's most eclectic offerings, and as it still seems a little less than perfect, its price must likely not be suicide-making, right? Well, the asking price is $4,990, which, per pound, makes this a pretty hefty deal. But does that price make this quattroporte Thunderbird the ambition of your quixotic quest? Or, does that just give you the thunder down under? San Francisco Craigslist or go here if the ad disappears. H/T to Rollo Grande for flipping me the bird! BTW- Can't see the poll? Vote in the comments, email help@gawker.com and let ‘em know.